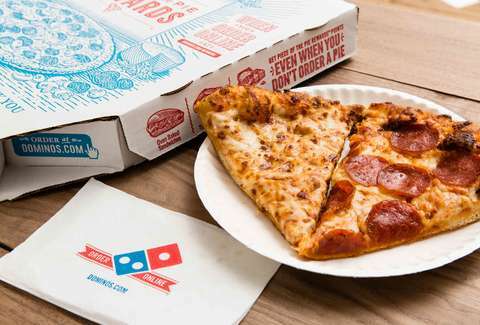 The Russian arm of Domino's recently ran a promotion that offered a Wonka-esque supply of pizza (100 free pizzas per year for the next 100 years) for any fans willing to tattoo their ubiquitous, dichromatic logo on a "prominent body part." In the end, they found out you can, in fact, have too much of a good thing. And no, I don't mean pizza. I mean brand-worshipping tattoos. The promotion (presented here, in Russian) was initially scheduled to last for two months, beginning on August 31. I'm sure Domino's figured a few exhibitionists would go out and get tatted after a few too many vodkas; they would post about it, get their pizzas, and the whole thing would be a positive maelstrom of attention. Unfortunately (fortunately?) it worked too well, and Domino's social media profiles were flooded with incredibly tasteful, tatted riffs of their logo. And this is only a small, small fraction of the hundreds of Russian pizza fans who desecrated their bodies to celebrate an international pizza brand. So people can still go out and get Domino's tats, of course, but they'll be doing so simply out of love. In the end, if the promotion was only intended to bring attention to the brand -- which, inherently, is the point of all promotions anyway -- they succeeded. And a few hundred people now have to explain their bad decisions to one to their hypothetical grandkids -- without the help of free pizza.